Scientists find a simple solution can give new life to some of the oceans’ most important ecosystems. Six feet below the surface of the Caribbean Sea, Lisa Carne holds a small ceramic disk with a chunk of elkhorn coral, its curled leafy shape resembling rust-colored kale, cemented onto it. She threads a plastic cable tie through holes in the disk, then fastens the other end of the tie to a lattice-like metal frame, one of a dozen or more anchored to the sandy floor. Carne deftly maneuvers her fins and scuba gear, careful to not disturb the surrounding coral, and repeats the process, attaching the ceramic cookies with their exotic flora onto the metallic grates, which sway rhythmically in the gentle current. Carne, an American marine biologist and manager of the reef restoration project Fragments of Hope, points to other, more mature coral beds around the caye: Elkhorn corals and spiky white-tipped antlers of staghorn corals, held in place by rope lines tied to large metal frames, are so overgrown that the artificial foundations sag under the corals’ weight. Carne planted these two years ago, the same way she did the other chunks a minute ago, and wants to show off how well they’re growing. Then, applying broad shoulders developed from clocking in long hours underwater with tanks strapped on her back, she hoists herself back into our fishing skiff. When she removes her mask and regulator her blue eyes and sharp features come into focus. We’re near Whipray Caye, a speck of an island eight miles offshore, in the Belize Barrier Reef Reserve System, a UNESCO World Heritage Site. This spot is the site of one of eight underwater coral nurseries that have been established around Laughing Bird Caye National Park, a protected area encompassing more than 10,000 acres of marine habitat that includes coral patches. On this humid March day, the sky is crystal clear, with temperatures hovering in the high 80s, and the sparkling sea all around is almost as warm as a hot tub—and significantly warmer even than the water several miles away. Carne is here as part of a last-ditch international effort to save the world’s coral reefs. As humans have filled the atmosphere with carbon dioxide over the last century and a half, the seas’ temperatures are rising, and with them the concentration of CO2 in ocean waters. Adding to the damage have been overfishing, which upsets the ecological balance around reefs, and coastal development, which causes erosion of soil into reef ecosystems. The result is severe bleaching, coral collapse, and disease that have wiped out an estimated 19 percent of the world’s coral reefs, with roughly three-quarters of what remains seriously threatened. Because marine biologists can’t do much about gas mileage standards for automobiles, deforestation, or coal power, they’re working on restoring reefs, and Carne found out, quite by accident, that certain species of coral do better than others in warmer water. Carne’s program employs methods similar to those at reef restoration efforts now going on across the globe: broken bits of the heat-tolerant coral collected from the sea floor are incubated on the metal-and-rope moorings below the bottom of our skiff, where they grow like tree clippings until they’re full enough to harvest—usually within a year or two. Pieces are then broken off—coral can reproduce like grafted plants—to transplant into the wild, ultimately forming hundreds of colonies of these hardier corals on damaged areas of the reefs. It’s early in Carne’s effort, but if she’s right, the corals she and colleagues are painstakingly coaxing back to abundant life could be deployed in the fight to save reefs from anthropogenic climate change. “This is critical work because it not only restores the ecological integrity of these habitats in southern Belize, but it provides a testing bed for methods of building reef resilience in the future,” says Nadia Bood, a marine biologist with the World Wildlife Federation in Belize City, which has funded Carne’s work since 2009. Reefs take up only about 2 percent of the ocean floor, but their value to other ocean ecosystems is enormous: They support a third of all marine life—providing habitat, food, and spawning grounds—which in turn feeds more than 500 million people, who depend on reefs for protection from storms, surges, waves, and coastal erosion, as well as for tourism. At the same time, reefs are widely considered the most vulnerable of the marine ecosystems to the effects of climate change, according to the most recent report from the U.N.’s Intergovernmental Panel on Climate Change, which darkly warned that the reefs are undergoing rapid, “potentially irreversible” declines. Coral depends for food on microscopic algae that live inside it, which transform sunlight into energy through photosynthesis. But warming conditions prompt the corals to expel the algae, draining the reefs of color—hence the term “coral bleaching”—and leading to coral death due to the lack of nutrients. Oceans, moreover, absorb about a third of the CO2 we dump in the atmosphere, which indirectly causes the seas’ pH balance to acidify. This change in ocean chemistry inhibits the formation of the calcium carbonate corals need to maintain their shells and dissolves the stony skeletons that support corals and reefs. As a result, they’re collapsing at a faster rate than rainforests. Caribbean reefs are in the worst shape, with 80 percent of the live coral cover lost since the 1970s due to heavy coastal development, hurricanes, overfishing, and climate change. It took Carne five years to get funding to test this idea in Belize. With a small grant from the Protected Areas Conservation Trust, Carne pasted 19 fragments of elkhorn coral to the dead reefs in Laughing Bird Caye National Park. A few months later, she found the corals were thriving. Emboldened, she secured funding from the World Bank and the World Wildlife Fund, among others. 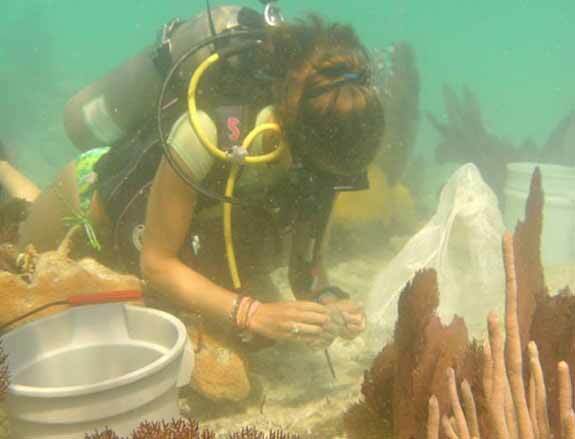 Since 2006, Carne and her cohorts, who include fellow scientists, students and teachers from local high schools and colleges, and environmental activists, have painstakingly planted more than 8,000 coral fragments around Laughing Bird Caye National Park. We make a brief stop at the coral nurseries off French Louie Caye, where Carne loads two large plastic tubs with the long, spiky branches of staghorns that she breaks off from the thicket of corals sprouting on their artificial frames. Then we head over to Laughing Bird Caye. Here in the reef-filled waters surrounding the caye—a picture-perfect acre-and-a-half sliver of gleaming white sands, coconut palms, and mangroves, with a cluster of picnic tables where diving and snorkeling expeditions congregate for lunch—the restoration’s results are most evident. Interspersed with the teeming marine life of the reef, next to the boulder-size brain corals, the delicate sea grasses, the fluttery sea fans, and the fire corals, are dozens of colonies of nursery-grown corals: majestic outcroppings of fully grown elkhorns, with leafy branches extending five feet or more, and the massive domes of staghorns, which, with their white-tipped tendrils, look like giant mums. “Roughly 80 percent of the corals we transplant survive,” says Carne as she sits on the boat deck. Sloshing around in the water-filled plastic tubs, she uses diving weights to break up the staghorn branches into pieces about an inch or two in length. Then we push each of the spiny fragments between strands of rope, seeding the rope’s length with dozens of pieces. They look like giant rock candy necklaces. The ropes are then woven through metal frames sitting on the sea floor. Within the year, they will be overgrown with healthy staghorns, and Carne will come back to break some off and seed it elsewhere on the reef. For the past two years Elizabeth McKenna has been keenly aware &#x2014; and concerned &#x2014; that many of the world's coral reefs are in trouble. So when it came time to choose a senior thesis project, the Princeton University ecology and evolutionary biology major decided she was going to help play a role in figuring out solutions to this pressing problem. "Coral reefs are one of the most diverse ecosystems on the planet, and maintaining those ecosystems is extremely important," McKenna said. "Not only is their biodiversity critical to aquatic ecosystems, but they're also important in terms of what they provide for humans, which includes everything from tourism and recreation to shoreline wave protection, fishing and even the discovery of new medicines." The danger to coral comes in many forms, including pollution, global climate change, unsustainable fishing and ocean acidification from atmospheric carbon dioxide. Coral reefs also face a threat posed by an unlikely culprit &#x2014; cruise ships. According to McKenna, cruise ship propellers often cause increased seafloor turbidity, resulting in sediment plumes that settle upon nearby coral, decreasing the amount of available sunlight and retarding their growth. "Sediment isn't entirely bad for coral," McKenna said. "Yes, too much sediment can block sunlight and prevent coral from maturing. But just the right amount of sediment can cover the dead coral skeletons, promoting the framework of the reef, and allow juveniles to attach more securely to the reef." To learn more about this delicate balance, McKenna embarked on an 11-week study last summer to research the effects of varying light and sedimentation conditions on the growth rates of juvenile corals at the Bermuda Institute of Ocean Sciences (BIOS) in St. George's, Bermuda. 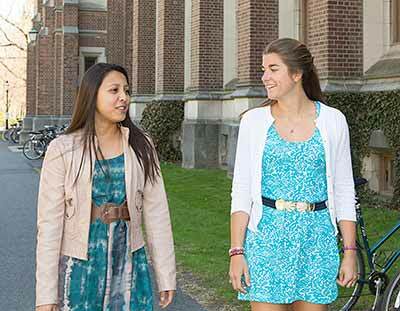 Princeton has an ongoing collaboration with BIOS in facilitating courses, student internships and senior thesis research opportunities. Through fieldwork conducted between June and August, McKenna investigated the ideal conditions for coral growth, which she said could eventually have an impact on future coral protection and preservation. "If the juveniles aren't growing, the reefs won't continue living," McKenna said. "The more we understand what they need to grow, the better prepared we are to enact policies that maintain those ideal conditions and promote healthy reefs." McKenna became interested in coral during the summer of 2012 while working as an education intern at BIOS. She worked with students between the ages of 11 and 19 at a marine science camp called Waterstart, designing marine science curricula for Bermudian schools and piloting courses with the campers. McKenna took students scuba diving every day, enhancing her underwater skills while increasing her passion for coral protection. In the fall of 2012 she learned about ecosystem services &#x2014; how humankind benefits from the workings of natural ecosystems &#x2014; and their valuation in junior seminars given by Simon Levin, the George M. Moffett Professor of Biology. The work inspired her junior paper on the ecosystem services of coral reefs, and Levin became her senior thesis adviser. "When she first approached me about her thesis I was struck by how much passion Beth had for the questions she wanted to explore," said Levin, who was awarded the 2014 Tyler Prize for Environmental Achievement in March. "I think she took on a very ambitious and important project, and I felt as though it could be a valuable contribution to this overall discussion, and hopefully a step toward preserving coral reefs in the future." McKenna embarked on a complex and physically taxing series of experiments that were funded by the Becky Colvin '95 Memorial Award, presented annually by the Princeton Environmental Institute (PEI) to support field research projects critical to the senior thesis. McKenna's work started last June with the collection of adult coral samples at a site called Hog Reef. Over several days, McKenna &#x2014; along with other BIOS researchers, including Princeton ecology and evolutionary biology graduate student Lisa McManus &#x2014; embarked on numerous dives during one day and chiseled off 20 small coral colonies, transferring each into a bag for transportation to the BIOS lab. Once there, the adult corals were placed into 12 containers on a wet bench where they began spawning larvae. After several days, the researchers collected the coral larvae to place into plastic containers with 29 terracotta tiles for settlement. The tiles, 2.5 centimeters by 2.5 centimeters, had been conditioned to a realistic settlement environment after being affixed to a reef for six weeks prior to the study. After several days of settlement McKenna and her colleagues chose 21 tiles that had at least six settled coral larvae on one tile face for experimentation. Excess settled larvae were scraped off. "This is when the fieldwork became really intense," McKenna said. "We were in for a lot of diving." Once the larvae had settled onto their respective tiles and were photographed, McKenna traveled by boat with four other divers to a reef just outside of Whalebone Bay. 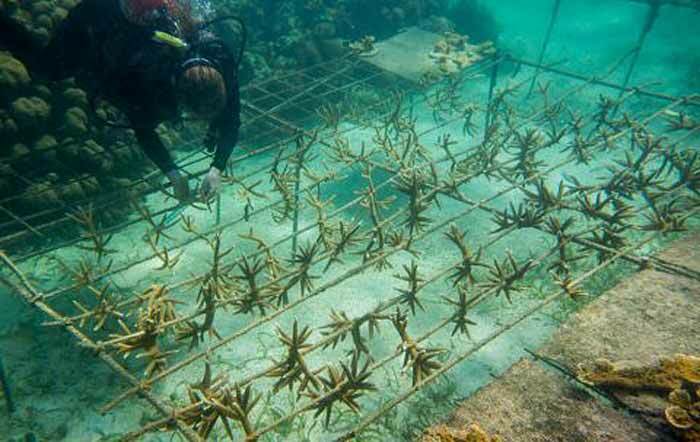 Each tile was cemented to the reef with underwater epoxy and given one of three "treatments" &#x2014; no shade, one shade or three shades. Treatments consisted of square plastic frames with either no shades attached, or with one or three pieces of window screening attached. 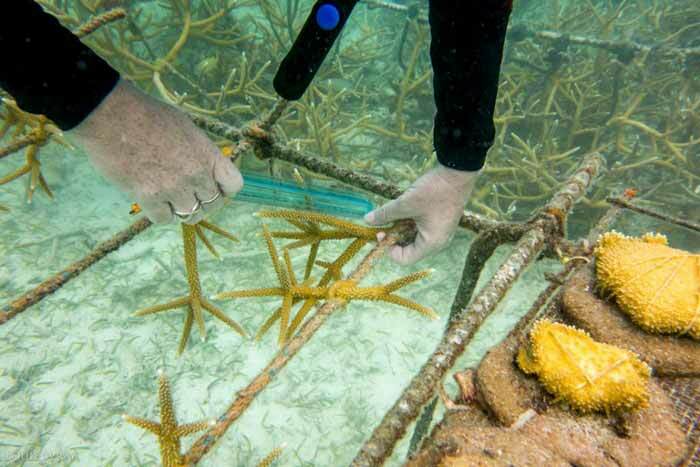 These treatments &#x2014; which were secured a few centimeters above the tiles with nails and zip ties &#x2014; represented varying degrees of shading that could impact the growth of the fledgling coral. 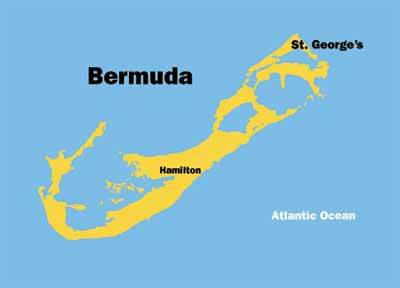 Studying Bermuda's coral reefs has deepened McKenna's environmental commitment. She said ... "if we're not always striving to better understand marine ecosystems, we're missing out on more than half of what makes our planet thrive." Finally, to construct the sediment traps, McKenna and her fellow divers hammered three pieces of reinforcing bar into the reef and then zip-tied traps that corresponded to the respective shade treatment type. The work enabled McKenna to train in science diving, certifying her as an American Academy of Underwater Sciences scientific diver. "This kind of diving was a very different experience for me," McKenna said. "I had a lot of diving experience from my previous summer, but that was mostly recreational. Getting used to working in an experimental environment underwater was challenging but also fascinating. Every time we went down we encountered different variables." 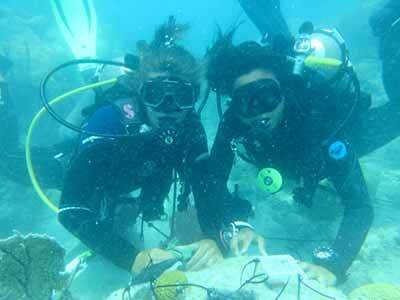 Three weeks later, McKenna and the other divers removed all the treatments and tiles, and brought them back to BIOS. Each tile was photographed and observed under a microscope, which allowed McKenna to calculate the growth rate of each sample while also noting the impact of their respective shade and sediment treatments. "What really excited me about this was the opportunity to do more than just an observational study and instead actually conduct an experiment," McKenna said. "It's fascinating when you have a chance to alter the environment to learn more about what they (corals) need to thrive." When it came time to analyze her data, McKenna realized there was a problem. When they first collected the adult coral samples in June, McKenna and her colleagues expected them to spawn immediately. But the process took longer than anticipated. Instead of leaving the larvae tiles underwater for six weeks, they had to settle for just three, "and that wasn't long enough for the treatments to have a significant effect on their growth," she said. Nonetheless, McKenna said the principles behind her study &#x2014; and those she would like to conduct in the future &#x2014; are critical to investigating the larger problem of threatened coral around the world. "Even though the results weren't 'technically' significant, the experiment itself was a good beginning and set up for further research into the ideal conditions for juvenile growth," McKenna said. After graduation, McKenna will spend several months leading diving trips for American high school students in Belize. She would like to take another year or two to conduct coral research, potentially at BIOS or another research station, before applying to medical school and possibly embarking on a career in pediatrics. "I just hope my research, in some way, helps underscore how important these types of studies are," McKenna said. "More than 70 percent of the world is covered in water, and if we're not always striving to better understand marine ecosystems, we're missing out on more than half of what makes our planet thrive." While rising ocean temperatures and human activities are generally seen as deadly threats to the coral reef systems throughout the world, there are going to be both winners and losers in the world's coral species in the future, a new study says. 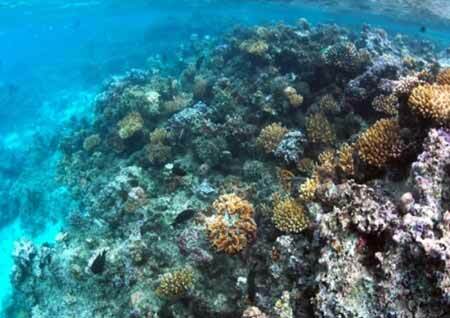 At least some present coral species will likely continue to survive in our planet's oceans amid both natural and anthropogenic environmental threats, experts at the National Center for Ecological Analysis and Synthesis of the University of California, Santa Barbara predict. 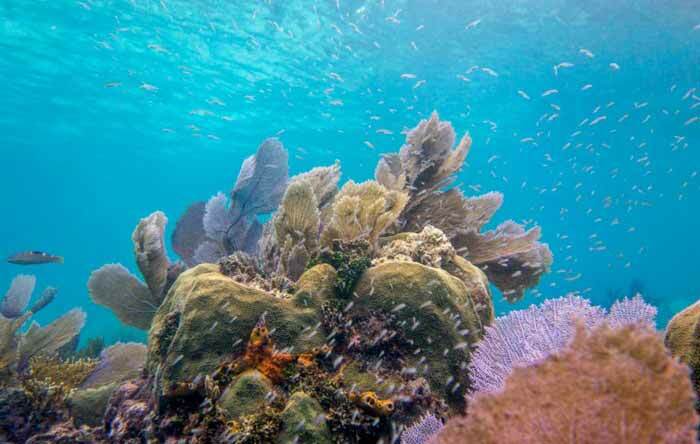 Twenty scientists from a number of U.S. universities were part of a Tropical Coral Reefs of the Future working group attempting to predict upcoming fluctuations in coral reef ecosystems in response to the menace of rising temperatures in the oceans. The group has published its findings in the journal PLOS ONE. The researchers examined data on contemporary reef ecosystems as well as fossil coral reefs from two places in the U.S. Virgin Islands and Belize in the Caribbean, and from Indo-Pacific sites in Hawaii, Taiwan, Moorea, Kenya and the Great Barrier Reef off Australia to simulate future coral reef outcomes. The scientists were able to develop trait-based models to explore the ecological success of some corals in warmer future ocean waters. "Although many corals are becoming less abundant, there remain a number of species that are holding their own or increasing in abundance and these corals will populate tropical reefs over the next few centuries," says lead study author Peter Edmunds, a biologist at California State University, Northridge. 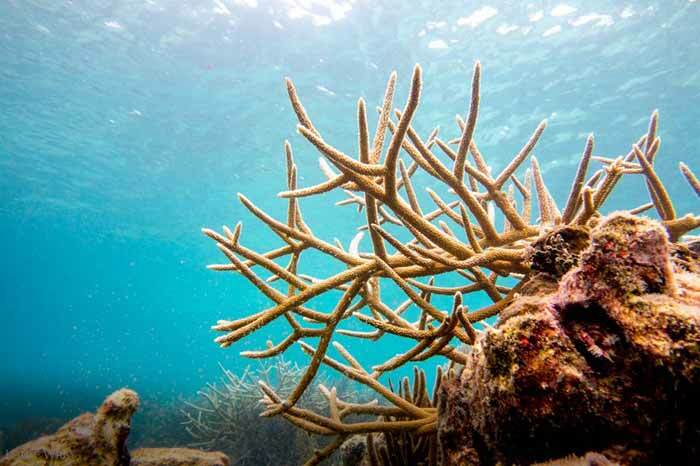 In addition to studies of current reefs, the researchers examined fossil evidence to analyze the effect of temperature changes on ancient coral reef ecosystems. Twenty-two species of coral are currently listed as "threatened" under the U.S. Endangered Species Act. The coral species with the best chances to survive in an ocean exhibiting increasing temperatures will be those that are fast-growing, more resistant to stress and which easily produce large numbers of offspring, the researchers say. 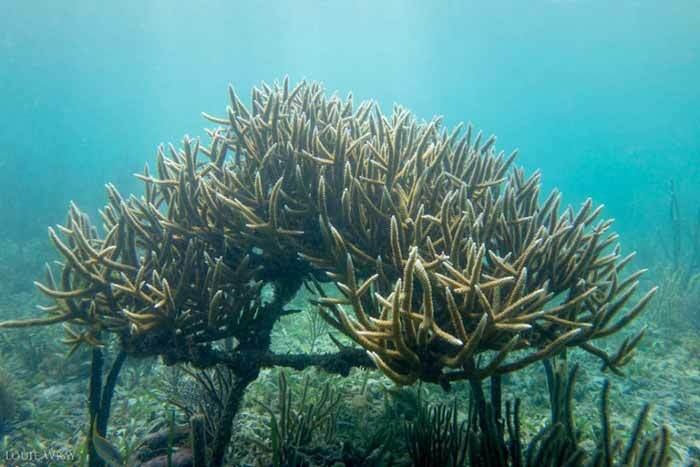 The world's reef systems may be facing a number of threats. The study nevertheless challenges the idea that live coral would someday be completely lost. 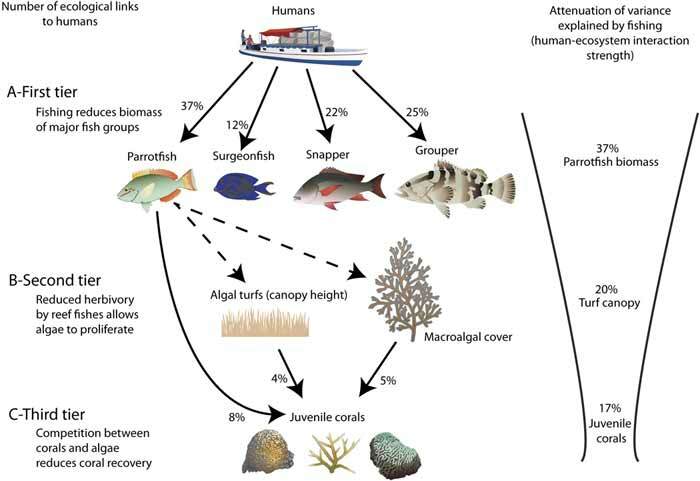 The tropical reefs of today may no longer unfold as many diverse ecological riches as before, but the findings prove some corals will survive amid environmental changes, notes Edmunds. Click here to read the rest of the article and see more photos in "Interesting Engineering"